What Is Glutamic Acid Decarboxylase? Protease inhibitors disable enzymes that microbes such as bacteria, viruses and fungi need to flourish. For this reason, natural and synthetic protease inhibitors are used to prevent and treat certain conditions and diseases. Today, researchers are studying natural protease inhibitors, found in a wide variety of edible plants, as potential cancer-preventing agents. Legumes, and especially soybeans, are an abundant source of natural protease inhibitors, according to the book "Pathology for the Health Professions" by Dr. Ivan Damjanov. Some research suggests that protease inhibitors found in soybeans may play a role in soy's anti-cancer properties, according to Damjanov, and may help protect against certain cancers such as breast and colon. The particular protease inhibitor found in soy, called Bowman-Birk, appears to help prevent tumor formation, according to "Pathology for the Health Professions." 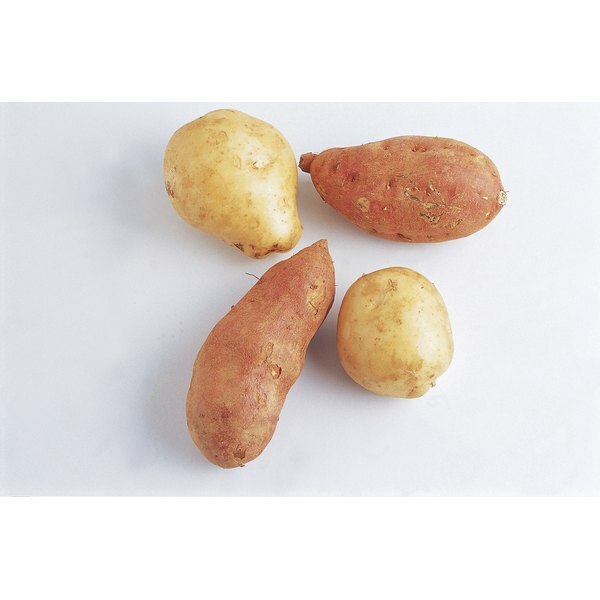 Another natural source of protease inhibitors is the potato, according to a review published in the June 2009 issue of the International Journal of Molecular Sciences. The authors of the review write that protease inhibitors from potatoes are shown to suppress tumor growth in clinical research settings. In addition, potato protease inhibitors suppress a hormone responsible for stimulating appetite. For this reason, the authors state that potato protease inhibitors may be useful at suppressing appetite. More research is needed to understand how well it works, however. Antioxidant compounds in green tea called catechins produce protease-inhibiting activity, according to a study published in the April 2003 edition of the journal Antiviral Research. The major catechin in green tea is epigallocatechin gallate, or EGCG. The protease-inhibiting activity of green tea catechins is also reportedly involved in green tea's anti-cancer benefits, according to the authors. The natural protease inhibitors in green tea may suppress infection by other pathogens, such as the flu virus and the adenovirus. These pathogens commonly cause respiratory infection in children. Though more common in Asian cuisine than American, blue-green algae is a nutrient-dense food and supplement. In addition to its vitamin and mineral content, blue-green algae contains protease inhibitors, according to the October 2008 issue of the journal Microbiology and Biotechnology. In fact, according to the authors, blue-green algae is a rich source of highly potent protease inhibitors. The authors confirm that protease inhibitors have potential anti-cancer benefits, as cancer cells are more sensitive to the suppression of protein than normal cells. What Are the Functions of the Digestive Enzyme Amylase? What Are the Causes of Diarrhea With Flatulence?